Java Virtual Machine components are depicted in below diagram. Each time we run java_application/java_class, an instance of JVM gets created. 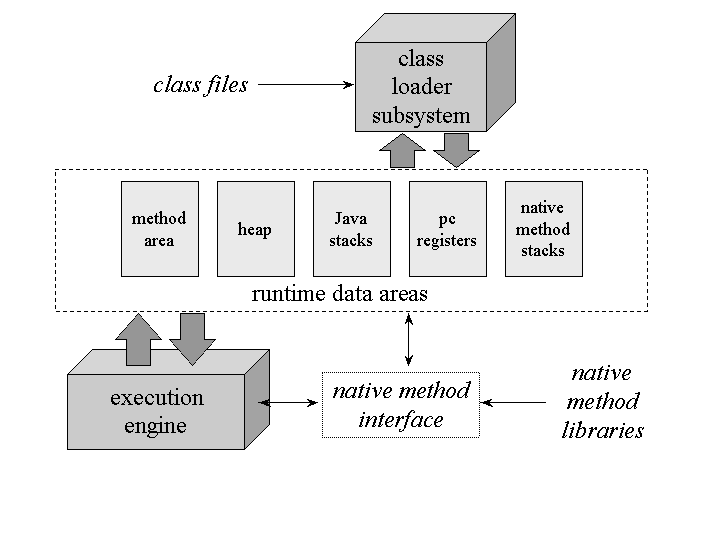 Class loader subsystem loads classes and interfaces with fully qualified names into the JVM. Execution Engine executes all instructions contained by methods of a loaded class. While executing a Java program, JVM requires memory for storing objects ,local variables, method arguments, return values, and intermediate computational results and JVM does that memory management on several runtime data areas. The specification of runtime data areas is quite abstract. This abstract nature of JVM specification helps different designers to provide implementation on wide variety of OS and as per choice of the designers. Some implementations may have a lot of memory in which to work, others may have very little. Some implementations may be able to take advantage of virtual memory, others may not. Each instance of the Java virtual machine has one method area and one heap. These areas are shared by all threads running inside the virtual machine. When the virtual machine loads a class file, it parses information about class type from the binary data contained in the class file. It stored the type information into the method area. As the program runs, the virtual machine places all objects the program instantiates onto the heap. When a new thread is created, it gets its own pc register (program counter) and Java stack. If the thread is executing a Java method (not a native method), the value of the pc register indicates the next instruction to execute. A thread’s Java stack stores the state of Java (not native) method which includes its local variables, the parameters with which it was invoked, its return value (if any), and intermediate calculations. The Java stack is composed of stack frames (or frames). A stack frame contains the state of one Java method invocation. When a thread invokes a method, the java virtual machine pushes the newly created frame onto that thread’s Java stack. When the method completes, the virtual machine pops and discards the frame for that method. In JVM ,the instruction set uses the Java stack for storage of intermediate data values. The stack-based architecture of the JVM’s instruction set optimizes code done by just-in-time and dynamic compilers. The state of native method invocations is stored in an implementation-dependent way in native method stacks, in registers or other implementation-dependent memory areas.